The global tennis season will once again kick off in Abu Dhabi as six of the world’s best male players and two of the world’s best female players compete for the US $250,000 prize. Serena Williams will take on older sister, Venus, on the opening day of the Championship. Men’s side sees world number one Novak Djokovic, world number two Rafael Nadal, defending MWTC champ, Kevin Anderson, French Open finalist, Dominic Thiem, Australian Open semi-finalist Hyeon Chung and recent Paris Masters Champion, Karen Khachanov. Since 2009, the Championship has welcomed the biggest stars in the world, and 2018 will be no different. Over 135,000 tennis fans have enjoyed the action on and off the court in the last ten editions of the event, and fans will be treated to world-class tennis once again this year. As always, unrivalled star played access to the public sets the MWTC apart from any other tennis event on the planet. 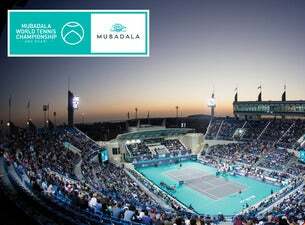 Through our player coaching clinics, autograph sessions, Q&A’s and of course the on-court action, there really is nowhere better to enjoy tennis than at the Mubadala World Tennis Championship!